Andy Walker clubbed 79 for Newborough seconds. Bourne’s Bentley brothers enjoyed a terrific time in a massive 143-win for the club second team over Spalding seconds in the South Lincs Premier Division. Rob Bentley (22) struck 64 and Josh Bentley (20) made 58 as Bourne amassed 199. Elder brother Tom Bentley (24) then claimed 5-21 as Spalding were rushed out for just 56. Bourne are fourth in the table, but Spalding are now deep in relegation trouble with just two games remaining. 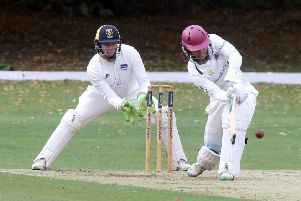 Spalding first XI’s relegation from the Lincs Premier Division was confirmed last weekend as they fell foul of a brutal batting onslaught from Bourne openers Pete Morgan and Conrad Louth. Morgan smashed a 39-ball ton and Louth hammered 66 from 38 balls as Bourne raced past Spalding’s 178 in just 12 overs and four balls! Captain Morgan struck five sixes and 16 fours in his whirlwind knock. Louth managed a mere one six and 13 fours. Daniel Milgate had earlier struck 52 for Spalding. Market Deeping’s season at the same level is finishing tamely. They went down by 93 runs at home to Louth despite 60 from teenager Alex Wheatley. Deeping are sixth, 30 points behind Bourne.